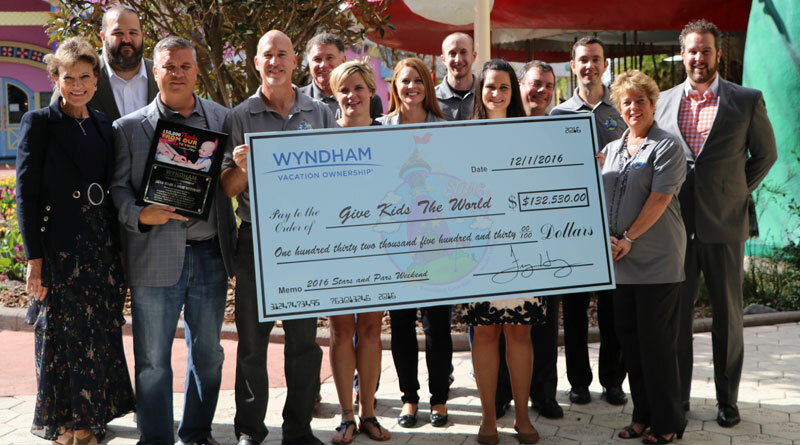 Wyndham Vacation Ownership (WVO) recently presented a check for $132,530 to benefit Give Kids The World (GKTW) Village, a non-profit organization in Kissimmee, Florida that fulfills the wishes of children with life-threatening illnesses and their families. The donation was comprised of proceeds raised from the fourth annual Stars & Pars Weekend and WVO’s contribution of $25,000. More than 40 Wyndham associates across various departments as well as Wyndham vendors came together to lead and coordinate this event, including a golf tournament that welcomed 128 golfers to the Tranquilo Golf Club at Four Seasons Resort Orlando, a two-day raffle, and a gala featuring a live and silent auction. More than 30 companies participated in the golf tournament with more than 19 companies represented at the gala. As part of the company’s philanthropic commitment, WVO is dedicated to enhancing the community through sustained corporate social responsibility and the support of organizations that make vacation dreams come true for families. Wyndham Vacation Ownership, a member of Wyndham Worldwide’s (NYSE: WYN) family of companies, is the world’s largest vacation ownership business, as measured by the number of vacation ownership resorts, individual vacation ownership units and owners of vacation ownership interests. Wyndham Vacation Ownership develops, markets and sells vacation ownership interests and provides consumer financing to owners through its seven primary consumer brands, CLUB WYNDHAM®, WorldMark® by Wyndham, CLUB WYNDHAM ASIA®, WorldMark South Pacific Club by Wyndham, Shell Vacations Club, Margaritaville Vacation Club® by Wyndham and WYNDHAM CLUB BRASILSM. As of December 31, 2015, we have developed or acquired 213 vacation ownership resorts in the U.S., Canada, Mexico, the Caribbean, South America and the South Pacific that represent more than 24,000 individual vacation ownership units and nearly 900,000 owners of vacation ownership interests. Wyndham Vacation Ownership is headquartered in Orlando, Fla., and is supported by approximately 17,700 associates globally.